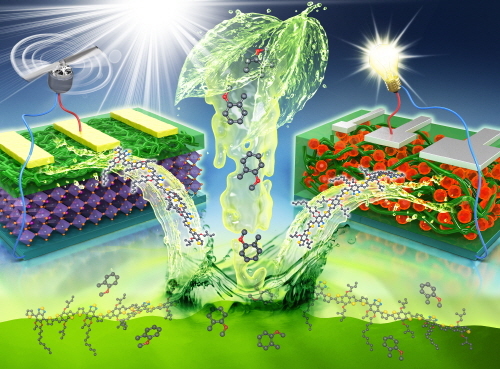 In this study, we demonstrated the effects of the molecular weight (MW) of a green-solvent processable semiconducting polymer (asy-PBTBDT) on its photovoltaic performance and device thermal stability in green processed devices for the first time. The asy-PBTBDT with a high MW (132 kDa) had the highest μh values (4.91 × 10−3 cm2 V−1 s−1 without dopants and 5.77 × 10−3 cm2 V−1 s−1 with dopants) as a result of increase in the π–π stacking along with MW as compared to low-MW asy-PBTBDTs (27 and 8 kDa). The high-MW asy-PBTBDT with a high μh achieved the best power conversion efficiencies of 18.2% and 20.0% for the undoped and doped states in PerSCs, respectively, and 5.7% in PSCs in green processed devices. Furthermore, the glass transition temperature increased with an increase in MW; this indicated an effective decrease in heat-induced morphological degradation in the photovoltaic devices. In addition, an increase in the chain density along with MW led to good robustness against humidity and oxygen.